Here’s a closer look at three new features that we’re shipping in curl and libcurl 7.49.0, to be released on May 18th 2016. If you’re one of the users who thought --resolve and doing Host: header tricks with --header weren’t good enough, you’ll appreciate that we’re adding yet another option for you to fiddle with the connection procedure. Another “Swiss army knife style” option for you who know what you’re doing. With --connect-to you basically provide an internal alias for a certain name + port to instead internally use another name + port to connect to. It is very similar to --resolve which is a way to say: when connecting to HOST1:PORT1 use this ADDR2:PORT2. --resolve effectively prepopulates the internal DNS cache and makes curl completely avoid the DNS lookup and instead feeds it with the IP address you’d like it to use. --connect-to doesn’t avoid the DNS lookup, but it will make sure that a different host name and destination port pair is used than what was found in the URL. A typical use case for this would be to make sure that your curl request asks a specific server out of several in a pool of many, where each has a unique name but you normally reach them with a single URL who’s host name is otherwise load balanced. --connect-to can be specified multiple times to add mappings for multiple names, so that even following HTTP redirects to other host names etc can be handled. You don’t even necessarily have to redirect the first used host name. The libcurl option name for for this feature is CURLOPT_CONNECT_TO. Michael Kaufmann brought this feature. In our ongoing quest to provide more and better HTTP/2 support in a world that is slowly but steadily doing more and more transfers over the new version of the protocol, curl now offers --http2-prior-knowledge. As the name might hint, this is a way to tell curl that you have “prior knowledge” that the URL you specifies goes to a host that you know supports HTTP/2. The term prior knowledge is in fact used in the HTTP/2 spec (RFC 7540) for this scenario. Normally when given a HTTP:// or a HTTPS:// URL, there will be no assumption that it supports HTTP/2 but curl when then try to upgrade that from version HTTP/1. The command line tool tries to upgrade all HTTPS:// URLs by default even, and libcurl can be told to do so. libcurl wise, you ask for a prior knowledge use by setting CURLOPT_HTTP_VERSION to CURL_HTTP_VERSION_2_PRIOR_KNOWLEDGE. Asking for http2 prior knowledge when the server does in fact not support HTTP/2 will give you an error back. Diego Bes brought this feature. TCP Fast Open is documented in RFC 7413 and is basically a way to pass on data to the remote machine earlier in the TCP handshake – already in the SYN and SYN-ACK packets. This of course as a means to get data over faster and reduce latency. The --tcp-fastopen option is supported on Linux and OS X only for now. This is an idea and technique that has been around for a while and it is slowly getting implemented and supported by servers. There have been some reports of problems in the wild when “middle boxes” that fiddle with TCP traffic see these packets, that sometimes result in breakage. So this option is opt-in to avoid the risk that it causes problems to users. A typical real-world case where you would use this option is when sending an HTTP POST to a site you don’t have a connection already established to. Just note that TFO relies on the client having had contact established with the server before and having a special TFO “cookie” stored and non-expired. TCP Fast Open is so far only used for clear-text TCP protocols in curl. These days more and more protocols switch over to their TLS counterparts (and there’s room for future improvements to add the initial TLS handshake parts with TFO). A related option to speed up TLS handshakes is --false-start (supported with the NSS or the secure transport backends). With libcurl, you enable TCP Fast Open with CURLOPT_TCP_FASTOPEN. Alessandro Ghedini brought this feature. This whole family of functions, fopen, fread, fwrite, fgets, fclose and more are defined in the C standard since C89. You can’t really call yourself a C programmer without knowing them and probably even using them in at least a few places. The charm with these is that they’re standard, they’re easy to use and they’re available everywhere where there’s a C compiler. Imagine you’d like to switch this example, or one of your actual real world programs that use the fopen() family of functions to read or write files, and instead read and write files from and to the Internet instead using your favorite Internet protocols. How would you do that without having to change your code a lot and do a major refactoring job? It is of course open source and is powered by libcurl. The project is in its early infancy. I think it would be interesting to try it out and I’ve mentioned the idea to a few people that have shown interest. I really can’t make this happen all on my own anyway so while I’ve created a first embryo, it will take some time before it gets truly useful. Help from others would be greatly appreciated of course. And it could even actually also read a local file using the file:// sheme. The idea here is to make the alternative functions have new names but as far as possible accept the same input arguments, return the same return codes and so on. If we do it right, you could possibly even convert an existing program with just a set of #defines at the top without even having to change the code! I think it is worth considering a way to provide an official macro set like that for those who’d like to switch easily (?) and quickly. 1. for non-scheme input, use normal fopen? An interesting take is probably to make fcurl_open() treat input specified without a “scheme://” to be a local file, and then passed to fopen() instead under the hood. That would then enable even more code to switch to fcurl since all the existing use cases with local file names would just continue to work. An interesting area of deeper research around this could be to provide a way to LD_PRELOAD replacements for the functions so that not even any source code would need be changed and already built existing binaries could be given this functionality. There’s also the GNU libc’s fopencookie concept to figure out if that is something for fcurl to support/use. 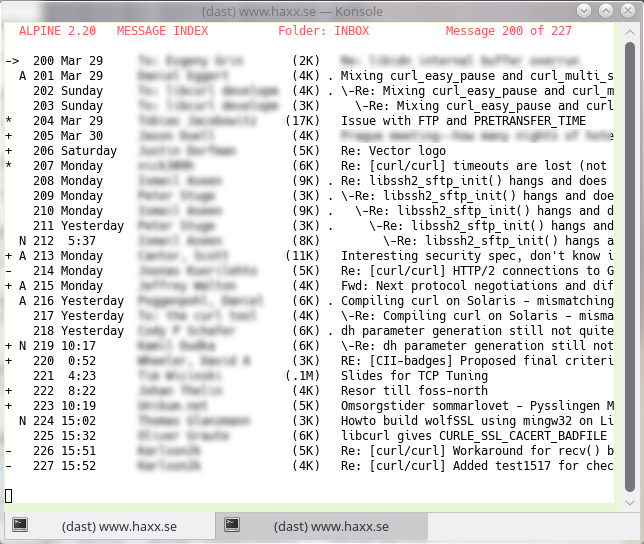 BSD and OS X have something similar called funopen. Please file issues or pull-requests. Let’s see where we can take this!